After 3-Day Retreat, GOP Battle Plan Still Only An Outline : It's All Politics Consensus might be hard on the issues of the debt ceiling and immigration, where the Tea Party wing has little in common with Speaker John Boehner and his allies in the House leadership. Speaker of the House John Boehner (right) speaks during the leadership press conference at the House Republican Issues Conference in Cambridge, Md., on Thursday. Friday's press conference, on the last day of the retreat, was canceled. 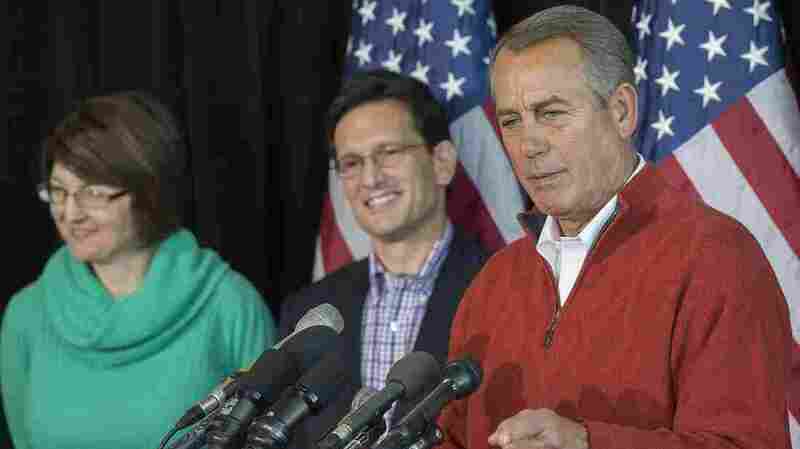 House Republicans headed back to Washington on Friday from a resort along the frozen waters of the Chesapeake Bay. They were there for a three-day retreat aimed at mapping out a legislative strategy for this midterm election year. One of the most pressing issues they face is the need next month for Congress to raise the nation's debt limit. GOP lawmakers seem leery of another debt ceiling showdown, and their leaders are pushing to act on immigration this year. Lest there were any appetite among House Republicans for tacking a list of demands onto a raise in the statutory borrowing limit, Speaker John Boehner made clear at the GOP retreat that this time, threatening default was not in his playbook. "We know what the obstacles are that we face," Boehner said, "but listen: we believe that defaulting on our debt is the wrong thing. We don't want to do that." That marked a stark departure from what became known three years ago as "the Boehner rule," which was the speaker's insistence that a dollar be cut from the federal budget for every dollar the debt ceiling is raised. That rule prevailed in a debt ceiling deal three years ago, when huge deficits loomed. But deficits are no longer the talk of Washington, and President Obama says this time, he wants the debt ceiling raised with no conditions attached. Ways and Means Committee Chairman Rep. Dave Camp of Michigan acknowledged the weak hand his party is playing this time. "The debt's going up, and we have I think a greater obligation than simply just to pass it along," Camp said. "But there is a political reality that the administration, and particularly the president, doesn't see it that way." Even debt hard-liners seem ready to toss in the towel. "I think we'd be glad to set terms, but as we saw through the shutdown, they were not interested in talking about anything," said Rep. Marlin Stutzman of northern Indiana, who has Tea Party ties. Meanwhile, House Republicans were presented at the retreat with a two-page list of principles their leaders say will shape a long-awaited immigration bill. Heading the list is tougher border enforcement, something immigration overhaul skeptics have been demanding and which Boehner endorsed. "You can't begin the process of immigration reform without securing our borders, and the ability to enforce our laws," Boehner said. "Everyone in our conference understands that's the first step in terms of meaningful reform of this problem." Unlike the sweeping immigration bill the Senate passed last year, there is no path to citizenship for unauthorized immigrants laid out in the House GOP principles. Only those brought by their parents might acquire expedited citizenship under the House plan. Wisconsin Rep. Paul Ryan is a leading voice in the House GOP on immigration. "I do not think you should have a special path to citizenship for the undocumented immigrant. I've been pretty clear about that," Ryan said. "This is why we're not going to take the Senate bill and we're not going to engage in a process that could result in the Senate bill." The principles do call for giving legal status to unauthorized immigrants who meet a series of conditions. That strikes Illinois Rep. Adam Kinzinger as problematic. "If you legalize somebody without a pathway to citizenship, you're creating, in essence, a class of people that have no chance of becoming citizens," Kinzinger said. But many House Republicans don't even want legalization of those immigrants. One of them is North Carolina Rep. Patrick McHenry. "Those that willfully broke the law should not be allowed to just continue to break the law," McHenry said. "So for me, as matter of principle, I don't think that legalization of those who willfully broke the law should be a part of our agenda." And Idaho Rep. Raul Labrador questions the timing of tackling immigration during an election year. "It's a great issue for Republicans to resolve; it's a bad issue for us to resolve this year," Labrador said. Oregon Rep. Greg Walden, who heads the House GOP re-election effort, foresees an immigration bill only after most primaries are over. "My hunch is it doesn't come up, you know, tomorrow," Walden said. "It's probably months out." If the retreat aimed to reach a consensus on these divisive issues, none emerged; a closing press conference was canceled.